Tribal Clash is returning to Portugal for the third time in 2019. Teams of 6 athletes (3 men + 3 women) will be racing in various challenges during the two-day competition weekend. This will be the biggest Tribal Clash yet, with up to 216 teams of 3 men and 3 women travelling from across Europe to compete on the stunning Praia do Almargem. CrossFit Nottingham’s ‘Team Hood and the Pirate’ will be chasing their third win in Portugal, going head to head with ‘Team Halo Tops’ and ‘Team Kratos’, winners and runners up at the 2018 UK event. It’s shaping up to be an epic weekend! Click here to register your team for Tribal Clash Portugal 2019. Your team spot at Tribal Clash is confirmed as soon as you have completed payment. From this point on, the spot is non-refundable and non-transferable. A few months prior to the event, you will be contacted using the email address you registered with to confirm the team name and a few other important details. Once these details have been confirmed, athlete waivers will be sent which must be completed by all registered athletes – your team will be unable to compete unless this has been done. Teams must check in on the beach the day before the competition begins. 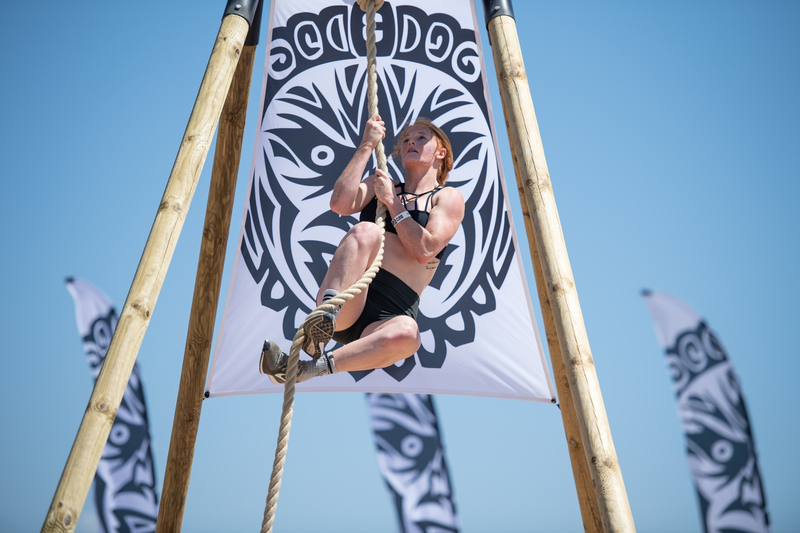 Only one team member is required to check in the team – this should be your nominated team captain – please confirm who your team captain is for this purpose. If you are unable to check-in on the Friday evening, it is possible to make alternative arrangements to check in prior to the first event on Saturday morning. Tribal Clash workouts are always kept secret until the night before the event, meaning that must train for the unknown and be ready for anything. We will announce Saturday’s workouts on the Friday evening, then announce Sunday’s workouts on the Saturday evening (as per the programme above). These athlete briefings will take place in the Tribal Clash arena on the beach. Our demo team will run through the workouts and movement standards, then there will be a brief question and answer session. Workout details will be posted on our website as well as on Facebook and Instagram. Athletes must make sure that they understand what is required and how the events are scored. We cannot answer any questions regarding the events until these athlete briefings, including whether everyone has to swim and how far, or how heavy the equipment is. Check out the team roster for Tribal Clash Portugal 2019 here. A heat schedule will be published here shortly before the event. The Tribal Clash shop will be selling merchandise all weekend – we will be accepting card payments or cash payments in Euros or GBP. We will also be joined by our event sponsor Progenex and Tugasox. Sports and remedial massage and taping will be provided by a team of sports therapists from Muscle Therapy Algarve. Spectators are invited to attend free of charge. Tribal Clash is a fantastic, family-friendly experience for spectators so come along, support your team and enjoy the electric atmosphere! Don’t forget the tribe that exhibits the greatest team spirit across the whole weekend wins the Tribal Spirit Trophy, as voted by the Tribal Clash judges. This is based on the presence and attitude of a team’s extended tribe as well as the athletes themselves, so bring as many supporters as you can and prepare to make an impact! Quarteira is just over 20km from Faro airport, the gateway to southern Portugal which is served by daily flights to destinations across Europe. Low cost airlines including EasyJet, Flybe and Ryanair operate flights to cities across the United Kingdom. On arrival in Faro, visitors can easily hire a car and drive about half an hour to Quarteira. Private transfers are also available, or visitors can travel by bus although this is not as straightforward. Quarteira is about 2.5 hours by car from both Lisbon and Seville, making it easily accessible for people travelling from other parts of Portugal and Spain. There is no train station in Quarteira but visitors can get a bus to nearby Loule and catch a train from here. The Tribal Clash arena on Praia do Almargem is about 5 minutes’ drive from the centre of Quarteira and can also easily reached on foot. – head for BJ’s Oceanside (Rua Foz do Almargem, 8125-000 Quarteira). There is plenty of free parking at Praia do Almargem. There are plenty of accommodation options to suit all budgets in Quarteira and the surrounding area. These include campsites, apartments, villas and hotels – a quick search online will bring up a vast number of options within easy reach of the Tribal Clash arena. Hot meals will be available throughout the day as well as a selection of sandwiches, fruit, cakes and energy bars. Please note that between Friday 3rd – Sunday 5th May, BJ’s Oceanside restaurant will only be open for customers who have made a prior booking. To book a table, please email bookings@bjsoceanside.com. There are plenty of other cafes and restaurants in Quarteira, easily reached by car or by a 15 minute walk along the beach. There are also a number of supermarkets in the area (including a Lidl which is just a few minutes away by car) where visitors can stock up!